Focus yourself with a five week experience led by professional teachers who invest in YOU with one on one feedback. Improve your confidence in how you audition. Be challenged and held accountable by teachers who will not only sort out your audition book, but help you navigate your life as an actor in this city to get the absolute most out of living and working here. If you’re looking to be challenged, ACTOR THERAPY’s five week program is perfect for you. 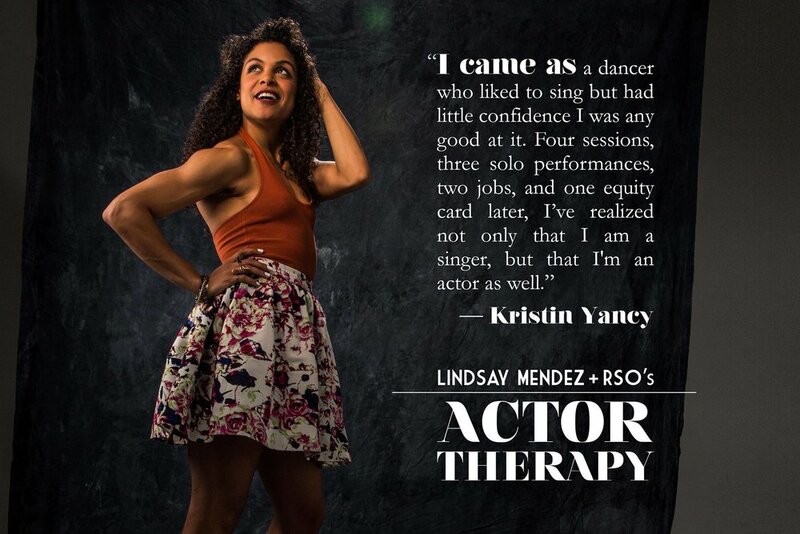 Your first five-week Session of Actor Therapy costs $699, with a $99 deposit due to reserve your spot and $600 due on the first day. If you decide to continue on to additional five-week Sessions, your price goes down. Every. Time. 5 classes (on a selected day, once per week) with two Master Teaching Artists each class, where each student gets 10-15 minutes for song-and-critique. Business Class. Each session features a new topic, from networking, to producing your own cabaret, to managing money. The opportunity to participate in three readings of musicals and plays. Everyone enrolled who signs up gets to read. Weekly e-life coaching and one-on-one hangouts with RSO and Lindsay, strategizing the next steps in your process. “Field trip” organized by Actor Therapy — promoting community building. This could be to Lincoln Center Library or to a pub for a post-class drink. A complimentary ticket to a Broadway or Off-Broadway show. Consideration to perform in an Actor Therapy concert at 54 Below later in the year. What, you think coming to class each week is enough?! Well, we don’t. Here at Actor Therapy we know that being an actor is about way more than working on that one sixteen bar cut. We’re already helping your book, let us help your soul, too! I mean, this is Actor Therapy, after all! o THE BIZ CLASS. This class, which does not count as one of your five AT classes, focuses on the different business aspects of our industry. Past topics have included “The Financially $ound Artist,” “Do More, Do Better,” “You’re An Artist, Damnit!,” “The Business of Show Business,” and more. PLUS, RSO is there to answer ALL of your big questions. Each class will focus on a different topic, but the main goal of each class is to get you thinking like a BOSS, because as RSO says, YOU ARE YOUR BUSINESS. o LET’S HANG OUT. Look, we know that life as an actor is hard. REALLY hard. Sometimes, you just need to walk it out, talk it out, and maybe even cry it out. That’s why RSO likes to offer a little private one on one time. This hang might be in the form of a long walk down a city street, or perhaps over a warm cup of coffee in a quaint corner booth. No matter the setting, we want to hear about your life. Sometimes a little heart to heart with someone who’s been there makes all the difference. So tell us what’s happening in your job, how you’re getting along with your roomies, how you felt about that last audition, and most importantly, what’s going on in your head! We want you to leave with your laugh a little brighter and your heart a little lighter. o YOU'VE GOT MAIL. We get it. Your book’s a mess and you don’t know where to start. That’s where we come in! Lindsay and RSO will stay in touch with you as you navigate new songs, work on that specificity and figure out who YOU are as an artist. Are you looking to add more golden age to your book? Lindsay and RSO can help you find that perfect Cole Porter or R&H tune. Cannot find the right pop song to save your life? Have no fear, they are here to expose you to Robyn, TLC, Bruno Mars, or Elvis. No matter you're struggle, we've got your back. Don't get us wrong, you gotta put in the work, but if you do- we will, too! o SHOW TIX. In the hustle of trying to make it to that audition, get to your day job on time, call your mom and feed your dog, it can be easy to forget why we became actors. This is why we do our best to obtain free or discounted tickets to currently running shows in NYC! We want you to take a moment to sit back, relax and get re-inspired by the magic of live theater. Plus, you may find a new AT friend or discover your new dream role! o AT FAM BONDING TIME. Class is great, but you know what makes it even greater? Friends who love and support you through it all. That’s why we have community building events, AT style, each session. Whether we’re grabbing a drink at happy hour, hiking in the great outdoors, or belting out our favorite holiday tunes, we ALWAYS bring the fun. Because we’re more than just class, we’re an ATFam.